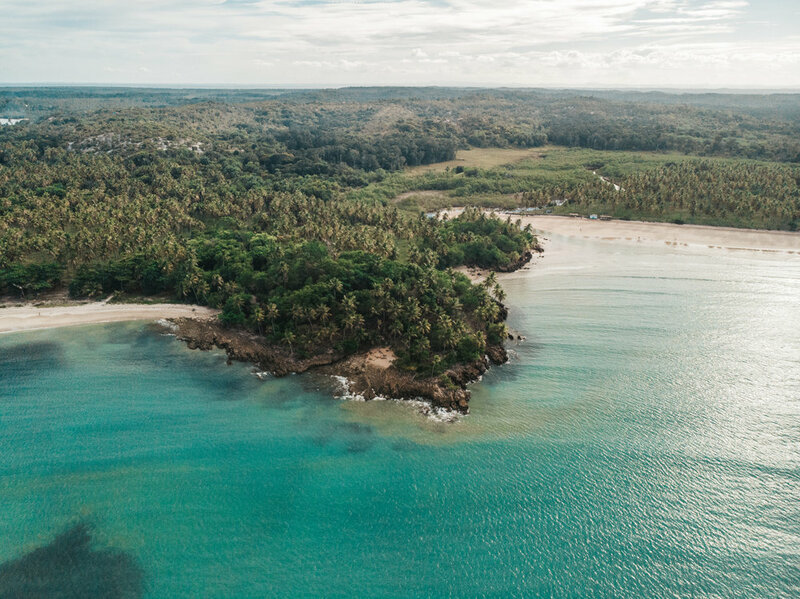 If you are looking to experience what the beaches of Brazil were like before tourism hit, then the island of Boipeba is the perfect spot to visit. With no motorized vehicles on the island - every day is spent on a new adventure by foot, boat, or donkey. All paths lead to sandy waterfront and water so clear it might as well be a pool. Boipeba certainly feels like a tropical dream. 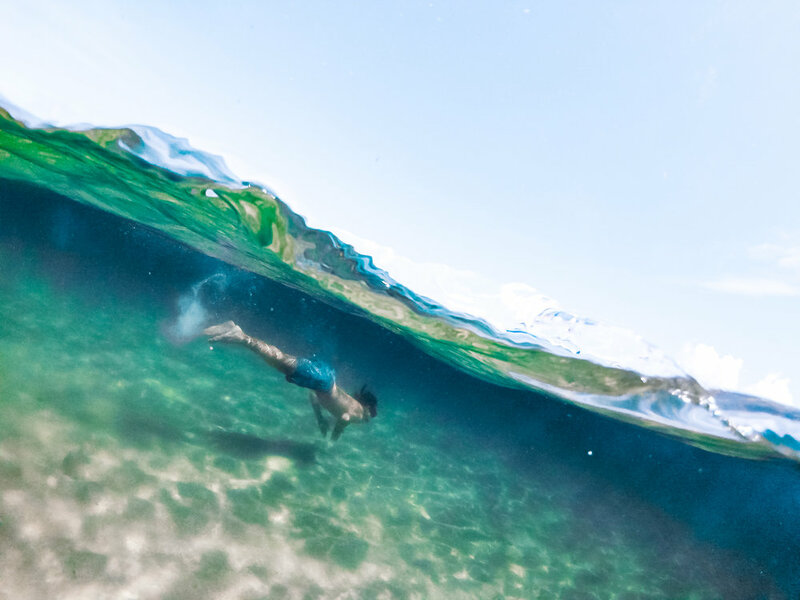 The reef surrounding it provides slow rolling water and some of the best snorkeling around. But our favorite part had to be the electric sunsets that turned the entire sky on fire with every shade of orange imaginable. Boat/bus: if you choose not to fly direct to Boipeba, then you will need to take some combination of boats and/or buses. Valenca: you can get direct boat rides from Valenca to Boipeba that take about 1 hr. They run daily and cost $5-$10 USD from Valenca, depending on where you are coming from, you can take a bus or another boat to get to Valenca. From other parts of Bahia: there are many buses (for example we took one from Trancoso) or you can take another boat from somewhere else along the coast. Morro do Sao Paulo: There are tourist boats that will go between Morro do Sao Paulo and Boipeba and will cost between $15-$20 USD. You can catch a ferry to here from Salvador (2.5 hours $20-$30 USD). Morro do Sao Paulo is a bit more touristy than Boipeba but still has excellent beaches. If you have time, you could choose to stay for a few days to compare the two. SPECIAL NOTE: We would advise against the ferry ride between Morro do Sao Paulo and Salvador. It may seem faster, but has to travel through open water so many times is a pretty bumpy ride. if you do take this path, snag a seat in the back near the open air so you can get a breather if you need. The island of Boipeba has a few different options ranging from B&Bs, hostels and nicer hotels. If you want a truly enchanting experience though, we would recommend O Ceu De Boipeba. The name in Spanish means “in the clouds” because it’s at the top of the island and gives you a stunning panoramic view that you simply cannot beat. The hotel is built in a chic bohemian style with mostly clear glass walls so there’s nothing to hide those fantastic views. Each suite has its own private balcony, perfect for watching the sun kiss the ocean at sunrise and sunset. This is where we stayed, and we were just overwhelmed by how enchanting it was. It basically felt like we were sleeping in glass tree house. Special Note: Only thing to consider is O Ceu De Boipeba is at the top of the island, and as we mentioned there are no motorized vehicles. That means that to get to the top you do have to walk up a short hill. They send a helper down to bring your bags up with wheelbarrows, but if you have a tough time hiking uphill, you may want to consider this before booking at O Ceu de Boipeba. The distance from the town center is about 10 minutes. Mornings were the best at O Ceu De Boipeba. 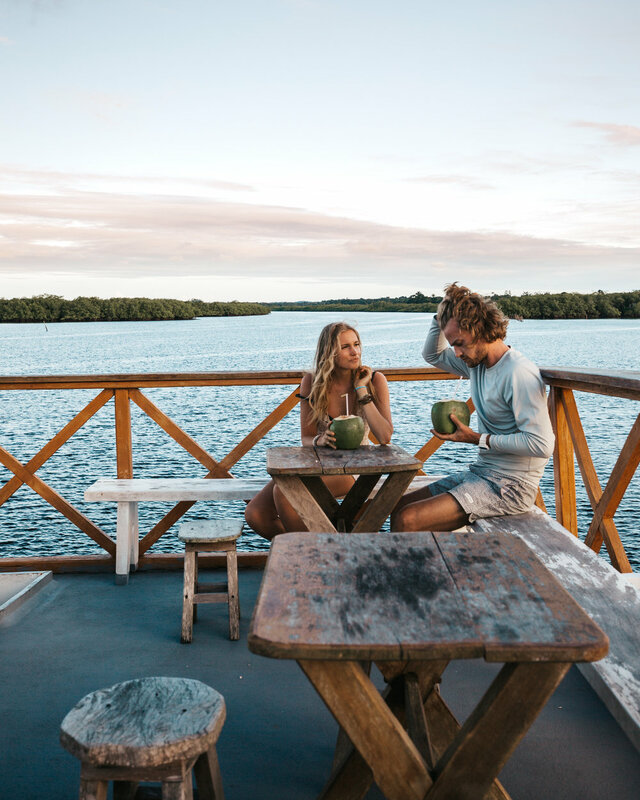 The glass tree houses gave you the perfect views of sunrise and we found it so peaceful to just open up the doors and listen to the sounds of birds chirping and feel island breeze. We woke up most mornings and just took it slow, doing yoga out on the patio and indulging in some of the delicious food their chef whips up. Our last morning they even brought it to our room and had one of the most magical breakfast views we’ve ever experienced! They have a plentiful menu of crepes, fresh baked breads, cheeses and fruits. With our paleo diet, they were so nice to cook up specially roasted vegetables and fresh fruit. Double YUM! During the day there’s a lot to do on the island. 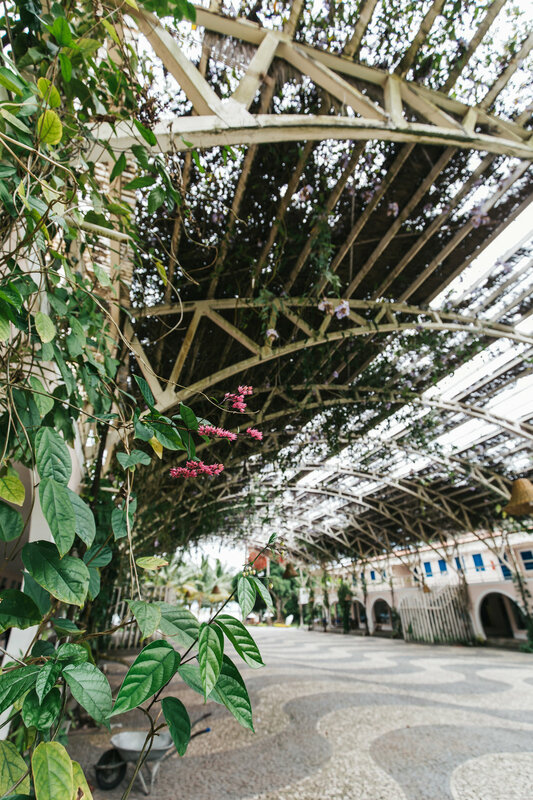 More on some the activities/tours below, but you can also hang out in the common area of O Ceu or explore the trails around the hotel. Remember, all trails lead to beach at some point or another ;) The whole vibe on the island is slower paced and peaceful, so make sure you take some time to unwind and soak in the relaxation and sunshine. At night Boipeba is really magical. The old town lights up with twinkling lights and all the stars come out to shine. Make sure to take time and appreciate the sunsets, because as we said before, they will light up the sky. There’s not a huge party scene here, though there are many restaurants/pubs open at night. Generally speaking, the nights are quiet and peaceful, perfect for romantic strolls and stealing secret kisses. Boat trip - Boipeba is known for its beautiful reef and excellent snorkeling. Taking a boat out to explore all the inlets and tide pools surrounding the island is an absolute MUST. Explore the beaches - Whether on foot, boat (or donkey) you won’t regret finding your way to the beaches of Boipeba. And it’s not hard to find your own slice of secluded paradise. Basically every shore is a new white sandy haven, and because the island is lesser known, there aren’t floods of tourists to battle with. Hike to the top of the island - There’s many different ways to see the beautiful views from Boipeba, but if you want one of the most stunning sunset or sunrise views, check out the hike to the top of the island. Dinner in the town square - There’s a charming old town in the heart of Boipeba that lights up with strings of Christmas lights and soft playing music. We loved to wander either down by the beach front or inland along the cobblestone roads feeling the warm salty breeze and staring up at the millions of stars. Sunset drinks with a view - Every night about an hour before sunset, the terrace bar at O Ceu de Boipeba starts to fill up with everyone wanting to come and “see the show.” As one of the best views of the island, O Ceu is a crowd favorite for sipping a sundowner as the sun disappears into the night. Canoe through the mangroves - On the west side of the island there are forests of trees practically growing straight out of the rivers and oceans surrounding the coast. It’s quite impressive to see, and if you get a guide, you can even canoe through these jungle trees called “mangroves.” If you’ve ever wanted to get your Indiana Jones on, this is your chance! Santa Clara - bright mosaic tiles and fresh dishes exploring a fusion of European and local Bahian cuisine. Serving up a lot of locally caught seafood and fresh produce. Casinha Latina - Mexican food in the heart of Brazil. This place serves up tacos, guacamole and freshly ground burgers. They will do everything in lettuce wrap or even do a special of grilled veggies if you ask. They also serve up patacones (crisp plantains) which are out of this world! Flor Da Lua - For a fancier meal with views of the sea, and seafood as fresh as it comes, definitely check out Flor da Lua. Lots of bright and delicious meals for all preferences. Check out their entree salads and grill platters. If you have any questions, feel free to comment below or send us a note.